ny others. With the same master he also studied White Crane Qin Na (or Chin Na), Tui Na and Dian Xue massages, and herbal treatment. , Dr. Yang continued his study and research of Taijiquan with several masters and senior practitioners such as Master Li, Mao-Ching and Mr. Wilson Chen in Taipei. Master Li learned his Taijiquan from the well-known Master Han, Ching-Tang, and Mr. Chen learned his Taijiquan from Master Chang, Xiang-San. Dr. Yang has mastered the Taiji barehand sequence, pushing hands, the two-man fighting sequence, Taiji sword, Taiji saber, and Taiji Qigong. 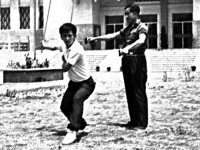 When Dr. Yang was eighteen years old he entered Tamkang College in Taipei Xian to study Physics and also began the study of traditional Shaolin Long Fist (Changquan or Chang Chuan) with Master Li, Mao-Ching at the Tamkang College Guoshu Club (1964-1968). He eventually became an assistant instructor under Master Li. In 1971 he completed his M.S. degree in Physics at the National Taiwan University and then served in the Chinese Air Force from 1971 to 1972. In the service, Dr. Yang taught Physics at the Junior Academy of the Chinese Air Force while also teaching Wushu. 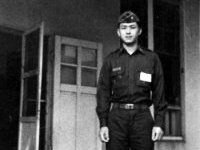 After being honorably discharged in 1972, he returned to Tamkang College to teach Physics and resumed study under Master Li, Mao-Ching. 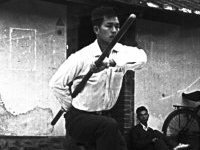 From Master Li, Dr. Yang learned Northern style Gongfu, which includes both barehand techniques, especially kicking, and numerous weapons. In 1974, Dr. Yang came to the United States to study Mechanical Engineering at Purdue University. At the request of a few students, Dr. Yang began to teach Gongfu (Kung Fu), which resulted in the foundation of the Purdue University Chinese Kung Fu Research Club in the spring of 1975. While at Purdue, Dr. Yang also taught college-credited courses in Taijiquan. In May, 1978 he was awarded a Ph.D. in Mechanical Engineering by Purdue. Chi Chuan. Currently, YMAA is an international organization, including 56 schools in Argentina, Belgium, Canada, Chile, France, Holland, Hungary, Iran, Ireland, Italy, Poland, Portugal, Spain, South Africa, the United Kingdom, and the United States. In the early 80's, Dr. Yang wrote several books, published by Unique Publications. In 1984, Dr. Yang retired from his engineering career, to undertake his life-long dream of teaching and researching the Chinese arts and introducing them to the West through many books, videos and DVDs. a pioneer in the cultural exchange between the East and West. While the West has successfully developed the material sciences, the East is celebrated for its levels of spiritual cultivation. During this ongoing period of exchange, the building of bridges is critical for the successful integration of the achievements of both societies. His books and videos have been translated into French, Italian, Spanish, Polish, Czech, Dutch, Bulgarian, Russian, Hungarian, Portuguese, Croatian, German, and Farsi. In summary, Dr. Yang has been involved in Chinese Gongfu since 1961. During this time, he has spent 13 years learning Shaolin White Crane (Bai He), Shaolin Long Fist (Changquan), and Taijiquan. Dr. Yang has more than thirty years of instructional experience: seven years in Taiwan, five years at Purdue University, two years in Houston, TX, and 24 years in Boston, MA. On November 29, 2005, Dr. Yang conferred the title of Taiji Master to one of his senior students (Roger Whidden)for the first time, which by tradition bestows the honorable title of Grandmaster upon Dr. Yang. ently travels within America and around the world presenting lectures and seminars on Chinese martial arts and Qigong. He has visited Argentina, Austria, Barbados, Botswana, Belgium, Bermuda, Canada, China, Chile, England, Egypt, France, Germany, Holland, Hungary, Iran, Ireland, Italy, Latvia, Mexico, Poland, Portugal, Qatar, Saudi Arabia, Spain, South Africa, Switzerland, and Venezuela. Dr. Yang has published over 30 books and 71 videos / 25 DVD on the martial arts and Qigong. Since 2004, Dr. Yang has been working to create the YMAA Retreat Center, a remote training facility in Humboldt County, CA, where he will spend ten years training a select group of students. In August 2008 Dr. Yang selected 5 disciples and started the first semester of training. President of Yangs Martial Arts Association, YMAA International. If you'd like to know more of Dr. Yang click here for an interview originally published in the 'Journal of Asian Martial Arts' .